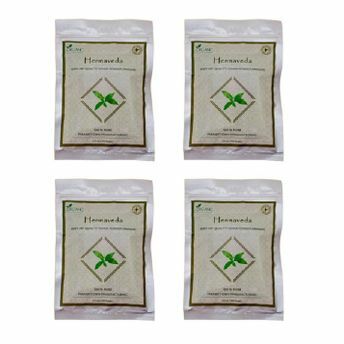 Hennaveda Body Art Quality Henna powder is made of superior quality, 100% natural and pure henna leaves. It is triple hand filtered, making it perfect for body art/henna tattoo. It can also be applied on hair for conditioning and coloring. It has natural cooling abilities that reduce the heat from your skin making it very useful for sunburns. Henna powder is the perfect way to create your desired designs on your skin without the permanent effects of a tattoo. Used for body art owing to its natural dye content, this powder is completely safe to use.